Black Friday UK Advent calendar deals are going to be very exciting this year. Millions of people in The UK buy an Advent Calendar to celebrate the daily build up to Christmas day, and located behind the windows are normally chocolate pieces. But they are now starting to be more themed with gifts behind them, are you ready to open consecutive doors to reveal a few wordings and some treat? Some of the most popular names on the market people search for include the Yankee Candle Advent calendar, beer ones, as well as No7, beauty, beer and benefit calendars. These are just a few of the top of our heads we can think off, but what ever one you choose you will see them a lot cheaper here when the Black Friday offers commence. 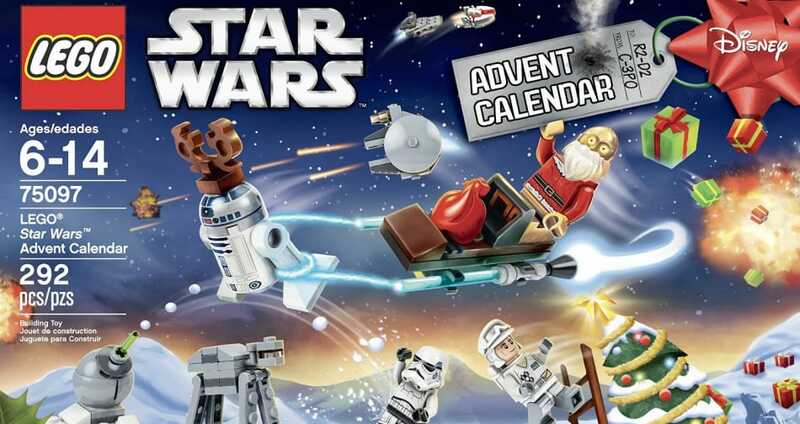 Two of our favourite ones include the LEGO Star Wars 75097 Advent Calendar, which comes with 24 themed gifts, with 5 of them being mini-figures and 2 holiday-themed droids. Also included are vehicles named the Sandcrawler, Millennium Falcon, Jabba’s Sail Barge, AT-AT, a sleigh as well as the Star Destroyer and Starfighter, plus an Ewok weapon rack, blaster rack and more. Another fave has to be for babies, the VTech Baby Toot-Toot Drivers; this one comes with 6 festive melodies, 3 Christmas songs and much more. Keep checking this Black Friday UK Advent calendar deals page for bargains of the year. Is there anywhere cheaper than Clarins themselves selling the LIMITED EDITION Clarins Advent Calendar, they have it on sale for a whopping £95, i would rsather spend a little less that that. You must be mistaken because it says they have none in stock. Sometimes it is easy to miss Kate, is nice though. Head on over to Superdrug online where you can buy the cool makeup revolution advent calendar for jsut £25 reduced from £40. This year I want a pork scratching advent calendar, any ideas where to buy a decent one? It is only August but what a better time to buy Advent Calendar, does anyone know that best and cheapest place to buy them from? Now is the time to buy some advent calendars, no one will be selling these for much money seeing as Christmas is like 11 months away. I really love the Yankee Candles Advent Calendars and that is what i will be looking for. Oh yes, the lush advent calendar 2015 is superb. My 12 Days of Christmas advent calendar arrived this morning – it was an ouch at £45 via the Lush website and now thinking i should have waited for Black Friday. Loving the feelunique Beauty Calendar, this advent calendar offers 12 days of beauty surprises with brand names including Philip Kingsley etc. Normally £85 but now 30 pounds. Go visit feelunique website to buy. The Play-Doh advent calendar looks brilliant, which comes with 24 surprises. The only issue is my child also loves the Playmobil Fire Rescue Operation Advent Calendar. My daughter would very much love the Disney Frozen Eternal Winter one, these are now cool and better than the traditional ones. I am looking at buying the LEGO City Advent calendar model 60099, but the cheapest i have seen is like £25, so hopefully Black Friday sale will help me save a few pounds.